Where Do Transplant Nurses Work? A transplant nurse cares for patients who are receiving or donating organs via a transplant surgical procedure. They prepare living donors who volunteer to donate organs and tissues for transplant and educate them on the procedure, recovery and risks. Transplant nurses also care for patients who receive organs by preparing patients for surgery, assisting during the procedure and providing post-operative care, including monitoring for complications like organ rejection. As with other nursing careers, the first step in becoming a transplant nurse is to complete an Associate's Degree in Nursing or Bachelor of Science in Nursing degree to gain a general nursing education. 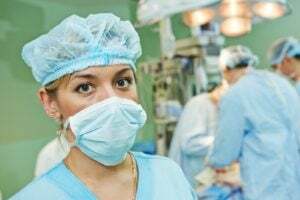 For nurses hoping to specialize in organ and tissue transplant, it is especially important to take medical-surgical courses and gain experience in critical care and intensive care. Once a nurse has completed schooling, they must pass the NCLEX-RN exam before beginning work as a transplant nurse. Once a transplant nurse has been working as an RN for two years, including 12 months of direct involvement in the care of organ transplant patients, he or she may take the Certified Clinical Transplant Nurse Certification exam offered by the American Board for Transplant Certification. To search and apply for current transplant nurse positions, visit our job boards. What Are the Education Requirements for Transplant Nurses? Transplant nurses are generally required to have completed an ADN or BSN degree, with a BSN degree preferred. They also must hold a valid RN license in the state in which they plan to practice. During the nursing education, an aspiring transplant nurse should be sure to take medical-surgical courses, as well as gain training in critical care and intensive care settings. While not required for many transplant nursing positions, RNs who wish to specialize in organ and tissue transplant nursing may consider becoming a Certified Clinical Transplant Nurse. The American Board for Transplant Certification offers this certification exam, which is open to RNs who have completed at least two years of experience as an RN and at least 12 months experience of direct involvement in the care of organ transplant patients. This certification offers RNs a competitive edge when seeking employment or advancement as a transplant nurse. Also, because most transplant nurses work with patients in a critical care setting, most transplant nurse positions require RNs to hold a Basic Life Support Certification, such as the one offered by the American Heart Association or the American Red Cross. A transplant nurse assists in every phase of the organ and tissue donation process, from the preparation phase to the donation procedure to recovery and discharge. They prepare living donors for the donation surgery, including educating them on the procedure, recovery process and risks associated with donation. They also assist with deceased donors by monitoring and preparing the donor's body for surgery. Transplant nurses also may assist surgeons during the transplant procedure by preparing the operating room and/or instruments, ensuring sterile and safe operating room conditions and monitoring the patient's vital signs. A large part of the transplant nurse's job is caring for organ recipients. Transplant nurses care for patients who need to receive tissues and organs, prepare them for the surgical procedure and provide post-operative care, including monitoring them for complications from surgery like organ rejection. As part of the post-operative care, transplant nurses administer medications and dress wounds, as well as educate patients on how to recover at home. What Are the Roles and Duties of a Transplant Nurse? The demand for organ transplants is high in the U.S., with more than 100,000 people awaiting donors in the U.S. according to the Organ Procurement and Transplantation Network. This has led to a significant growth in demand for medical professionals trained in organ transplantation. The median wage for registered nurses as a whole is $68,450 annually according to the U.S. Bureau of Labor Statistics, and nurses with specialized skills and knowledge may earn even higher incomes. While salary may vary based on geographic location, education level and years of experience, relevant certifications, such as the Certified Clinical Transplant Nurse Certification, can also help nurses earn higher pay.